Posted by Stuart Herbert on April 3rd, 2008 in Shoot. Last December, Kristi and I headed down the M5 to Cornwall, and the modern wonder of the world that is the Eden Project. Created out of a reclaimed clay quarry by sheer bloody mindedness and a vision that just would not die, the Eden Project is many things to many people. A remarkable botanical garden to some, dominated by the two huge biodomes (with a third in the planning stage). To others, a fantastic educational centre. And to music lovers, a superb outdoor venue that’s home to the Eden Sessions. 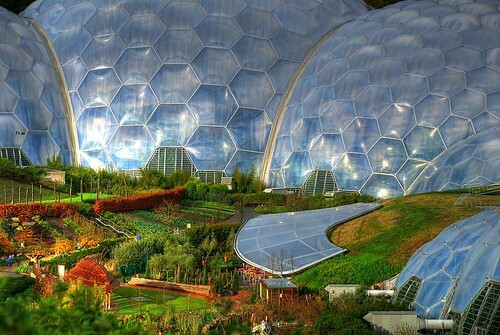 What makes all of this possible, and what makes the Eden Project stand head and shoulders above other botantical gardens in England and Wales, is that the Eden Project is a fusion of art, science and technology. It’s impossible to come away from the Eden Project having not been touched by its unique approach. This was our first visit to the Eden Project, but it will not be our last. The Eden Project is run by the Eden Trust charity. When you pay your entrance fee, if you sign up for gift aid, you get a membership card that entitles you to return to visit again for up to twelve months. The first sight that greeted us as we stepped through the doors and out into the gardens was the massive rainforest biodome. There’s a very popular observation platform right outside the shop’s doors, and there’s no shortage of shots on Flickr taken from here. Yours truly duly had a go too, and I got very lucky with the way that the low winter sun reflected off the biodome. From there, we worked our way down to the Core, which is the education building. Walking in, you can’t help but be drawn to The Nutcracker, a fantastic moving sculpture exploring the idea of just how overcomplicated can you get when trying to crack a nut. It had my complete attention, so much so that I couldn’t tell you what else was in the room with it that day. At the heart of the Core stands the Seed, a huge granite sculpture in a very small room, lit from above through a curious skylight. It’s almost as if they created this space just to challenge every would-be photographer who comes through. Next time, I want a Nikon D300 (or a D3!) and a Sigma 10-20mm lens to try my hand at this. From there, we made our way into the biodomes. There are two indoor biodomes – the Mediterranian Biodome and the Rainforest Biodome – plus one more in planning (the Edge). On top of that, don’t overlook the Outdoor Biodome – everywhere outside under the sky! That sort of viewpoint is typical of the Eden Project, and a great example of how different thinking makes the place unique. Unfortunately, my camera succumbed to the humidity in the Rainforest Biodome. Either the Nikon D200’s weather seals aren’t up to that particular challenge, or my Nikon 18-135mm lens is the weak point there. I did snag a shot of the back of a leaf not far inside the Rainforest Biodome, but unfortunately that was it for a few hours. Dusk brings with it another phase in the Eden Project experience. The place lights up in a wonderful display. My personal favourite is the play area outside where the colours are never constant. There’s a bench nearby that also changes colour in sync. I found it very calming indeed. It’s a long journey (4 hours+) each way to visit the Eden Project from here in South Wales, but it was well worth it. We barely scratched the surface of what there is to see, and we’re looking forward to seeing how Eden looks at the height of the summer. Here are my best photos from the day. I had intended to HDR all of the night-time shots, but they really didn’t work out at all well. Whatever the technique is for HDR at night, I definitely don’t have it yet! But I am really pleased with the HDR results for the photos taken during the day. Unusually for me, I remembered my tripod, which is a big help when shooting individual frames over a distance. Photomatix Pro does a great job of aligning individual frames – even the ones I take hand-held – but I don’t have the technique to keep the camera steady in my hands to shoot five frames and have them align perfectly back at the computer. Heck, even with the tripod, the shake from the camera shutter makes a difference. When I go back again, I’m going to need more than just a solitary 2GB memory card, that’s for sure! The Eden Project is an incredibly popular place for photographers; there are over 30,000 photos on Flickr alone taken there. I’ve only scratched the surface in compiling this list of personal favourites. I would have liked to show thumbnails of all of these photos, but unfortunately many of them do not have thumbnails available; I don’t know why. What are your favourite photos of the Eden Project that are up on Flickr? Share yours in the comments below. You you could make changes to the webpage name title Winter In Eden | Stuart’s Photography to more catching for your content you make. I liked the blog post yet.